The 2014 Sochi Winter Games will head into the record book as being the most expensive Winter Olympics to date. The estimated cost of the event is already being estimated at $12 billion. That's well over twice the cost of the Vancouver Games. Sochi, unlike Vancouver, lacks venues and infrastructure which is a huge part of the costs as well as a poor world economy over the last few years. The Russian government has allocated 250 billion roubles ($8.34 billion) from the National Wealth Fund to set up a home loan programme which should support struggling construction sector that was one of the drivers of the Russian economic growth before the crisis. The Russian government is stepping up to cover a huge portion of the bill for Sochi but some estimates about the deteriorating infrastructure as well as the creation of new venues may put the cost around the $20 billion mark! The 2010 Vancouver Olympic Winter Games are hosting their Closing Ceremonies as we take a look back at some of the pros and cons of the Games. The events started off with tragedy as Georgian luger Nodar Kumaritashvili died within hours of the Opening Ceremonies. The weather did not cooperate and the events were filled with peaks and valleys. Canada finally won a Gold Medal when hosting the Olympics and led the crowd with 14. The once dominant Russian teams, however, barely failed to show up on the charts finishing in 6th place with only 15 medals (3 gold). This is a far cry from the athletic machine of the 80's and 90's and not exactly a positive note heading into the 2014 Sochi Winter Games hosted in southern Russia. Russia failed to medal in hockey for the first time in over 4 decades. The following AP report takes an in-depth look at the highs and lows of the 2010 Vancouver Games. VANCOUVER, British Columbia — These Olympics will be remembered for all the wrong reasons. Even the games' emotional high point — a figure-skating bronze for Canada's Joannie Rochette, whose mother had died four days earlier — was tinged with sorrow. In the end, Team Canada's Sidney Crosby was able to outlast Team USA's Ryan Miller. A tough Gold Medal game had to go into overtime before Crosby was able to slip one past the fantastic Miller. The men's hockey game was one of the final events before the closing ceremonies Saturday night when Vancouver closes out its Games and hands the torch to Sochi, Russia. The Games started out a tad slow for Canada but in the end they were able to lead all nations in Gold Medals (not total Medals) with 14. USA led total Medals with 37. Canadian men’s hockey has a golden Olympic shimmer once again. [via About.com] The U.S. Olympic Committee (USOC) announced that Olympic gold medalist Billy Demong (Vermontville, NY) has been selected as U.S.A. flag bearer for tonight's 2010 Vancouver Olympics Closing Ceremony. Demong was selected for this honor by his fellow members of Team USA. "Being chosen as flag bearer is a phenomenal honor," Demong said. "It could have been any one of my teammates, and it is meaningful that our peers are taking notice of what we've achieved." Team USA will play Team Canada today for the rights to the Gold Medal. 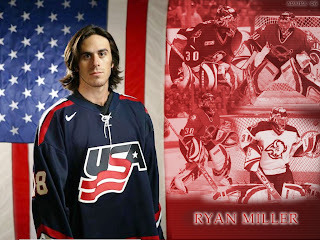 Many Canadians take for granted that their home team will bring home the Gold as does Team USA's goalie, Ryan Miller, who all but guaranteed a win tonight. OK, he didn't really do that but someone pretending to be Miller did on MSNBC. Apparently, the channel has hired Dan Rather's team of fact checkers to screen calls. Funny stuff. Here's the interview followed by the apology for MSNBC realizing they were victims of a prank. VANCOUVER — Joannie Rochette won the hearts of Canadians with her emotional skate Thursday to win the bronze medal just days after her mother died. Sunday she was chosen as Canada’s flag-bearer for the closing ceremony. Rochette, of Ile Dupas, Que., decided to compete in the Games to honour her mother Therese, who died Feb. 21 of a heart attack. She placed third after the short program and maintained that position after the free skate. VANCOUVER (AFP) -- Germany edged out Japan to win the Olympic Games women's speed skating team pursuit title on Saturday, but only after golden girl Anna Friesinger-Postma had crawled comically across the line in the semi-finals. Racing against the US, the 33-year-old stumbled on the final lap before slipping headfirst along the Richmond Oval ice and then crawling across the final 25 metres to get over the line, just 0.23sec ahead of the Americans. In the final, the Japanese team led the Germans for five laps as Stephanie Beckert, Daniela Anschutz Thomas and Katrin Mattscherodt trailed by more than a second. But in the final 600 meters Germany turned up the heat and crossed the line in 3min 2.82sec to take gold by just 0.02sec. [via NBC Olympics] WEST VANCOUVER, British Columbia (AP) -- Canadian Jasey Jay Anderson put the exclamation point on his incredible resume Saturday, winning Olympic gold to slap some sunshine on an otherwise miserable day for snowboarding. The 34-year-old from Quebec, owner of seven World Cup championships, carved through the rain-sluiced, fogged-in course at Cypress Mountain to make up a .76-second deficit over Benjamin Karl of Austria, the top-ranked rider in the world. "Shock," Anderson said when asked how he felt. "That's it." He won the 12th gold medal of the Vancouver Games for Canada, which put the host in good position to win the gold-medal standings with only one day left. And he won his first Olympic medal in four tries, adding it to his four world championship golds and a career that has done more than anyone's to spread the word of snowboarding across his wintry country. 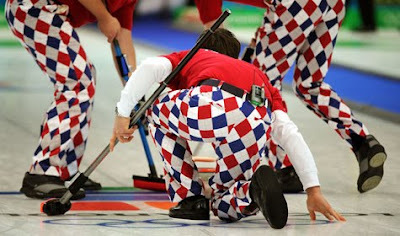 [via NBC Olympics] "I think I'll join the bowling tour," he joked to his young teammates. "Have y'all ever seen me bowl?" Hedrick wanted to go out with gold Saturday, but didn't seem too upset about settling for silver in his farewell to speedskating, losing out to the Canadians by a mere 21-hundredths of a second in the final of team pursuit. The 32-year-old Texan claimed his fifth medal _ in five different events, making him one of only four males in Olympic history to compile such a versatile resume. "It's sort of bittersweet," Hedrick said. "I was reflecting on everything as I was out there after the race, just sitting down on the bench, looking around and soaking up the atmosphere. It's definitely been a great ride." Team USA skier Bode Miller decided to compete in this year's Olympics and the effort has paid off. Unlike his 2006 fiasco, Bode was able to stay focused and came back from Vancouver with 3 medals (1 gold, 1 silver, 1 bronze). His event on Saturday, the slalom, resulted in Bode not finishing after he missed a gate. VANCOUVER, British Columbia — Having already matched the most medals won by any country at any Winter Olympics, Americans went into the last two days of the Vancouver Games seeing how many more they can add. The U.S. total is officially 34, although two more are locked up, guaranteed to be gold or silver. One of those was to be determined Saturday afternoon, when speedskater Chad Hedrick and the men's team pursuit squad raced against Canada. The women were in the bronze-medal race in the same event, having lost a semifinal Saturday. If they can beat Poland for medal No. 37, that would break a tie between this U.S. delegation and the Germans at Salt Lake City in 2002. If not, maybe Steve Holcomb and his "Night Train" can do it. They are strong favorites to win the four-man bobsled race after setting track records in both of their first two heats. The final two heats were later Saturday afternoon. Team Canada and Norway faced off Saturday night for the Gold Medal in curling. Since the sport returned in 1998 Canada men's and women's team have always won a medal. The men going into tonight have 2 Silvers and 1 Gold from 2006. Canada would have won the Gold Medal in 2002 if it were not for a slightly better team from Norway being able to win. The rematch tonight turned out different as Canada easily won the match 6-3. The home crowd even began singing "O' Canada" in the last frame which made Canada skipper Kevin Martin pause until the song finished. Earlier in the day Sweden and Switzerland battled for the Bronze Medal with the Swiss winning 5-4. Kevin Martin took the step Saturday that he's waited his whole, brilliant curling career to take — to the top of the Olympic podium. The 43-year-old Edmontonian, who's spent eight years dealing with questions about his loss in the 2002 Olympic final, put those questions, finally, to rest at the Vancouver Olympic Centre, skipping Team Canada to a 6-3 victory over Norway's Thomas Ulsrud in the men's curling gold-medal game. It was Canada's 25th medal of the Olympics, surpassing its Turin total of 24, and making it Canada's best-ever Winter Olympic performance. [via USA Today] WHISTLER — W.H. Auden wrote a poem called Night Train about a train crossing the border and delivering mail. Driving the bobsled nicknamed Night Train, USA-1 pilot Steven Holcomb crossed the border and delivered a long-awaited gift: a U.S. Olympic gold in four-man bobsled Saturday for the first time since 1948. USA-1's performance — with Holcomb driving near perfect and Justin Olsen, Steve Mesler and Curt Tomasevicz pushing the sled at the start — was poetry in high-speed motion. Sven Kramer lost the 10,000 meter speed skating race after his coach told him to change lanes at the wrong time. He would have easily won the event but was disqualified. In light of the recent snafu in the men's 10,000 meters speed skating event, here's a list of eight of the greatest gaffes in Olympic history.